Among the many opera composers who were active during the later 18th century, Mozart so dominates the present-day repertory that one is tempted to think that his operas are the only ones that are still worth hearing. 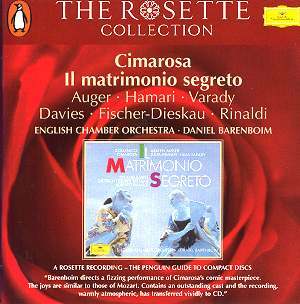 Yet nothing can be further from the truth, as this spirited performance of Cimarosa�s The Secret Marriage shows. A couple of further observations amplify the point. During the decade after 1781, the decade of Mozart�s years in Vienna, that master actually occupied eighth position in terms of the number of operatic performances in the Imperial theatres. Among those ahead of him were the Italian expatriates Giovanni Paisiello, Domenico Cimarosa and, of course, Antonio Salieri. The present opera by Cimarosa dates from 1792, the year after Mozart�s death, and its first performance was so enjoyed by the Emperor Leopold II that he provided supper for the whole cast and orchestra so that he could hear it again that same evening. Listening to this sparkling performance, it is easy to understand the Emperor�s enthusiasm. Moreover, this latest reincarnation of the recording makes it hard to believe that the original was made fully thirty years ago. This is a tribute to the quality of the sound as much as to the performance itself, excellent though the latter undoubtedly is. This latest version is attractively produced with a 68-page booklet that includes full track listings, artist photographs and the libretto in parallel Italian and English. Having gone to this much trouble, it is surprising that there is no other documentation by way of background material, and no synopsis. Such are the vagaries of reissues. Anyone who has heard the opera buffe of Mozart - Le nozze di Figaro for instance � will readily recognise the same style in this Cimarosa opera. For �number opera�, with its more extended finales, was the prevailing approach during the period, and Il matrimonio segreto employs this method with remarkable vivacity and flair. One number after another fizzes with life and musical appeal, consistently delivered in this performance with vocal confidence and assurance. The recitatives are lively enough to sustain interest even on CD without any visual element, while the appealing inventiveness of the arias and ensembles is such that number after number proves to be a delight. As such each singer has the opportunity to shine, while the orchestral accompaniments add beautifully judged support and offer interest in their own right. The cast could hardly be better, since it consists of six experienced singers who were assembled while at the heights of their careers and the top of their form. As an example, listen to the Act I sextet (track 12) in which they all feature. The pacing and balancing of forces by Barenboim is exemplary, and all the cast can be heard working together, to full and telling effect. There are also various solo opportunities, of course. Julia Hamari sings beautifully in her Act I aria, in which Fidalma advises the young Elisetta, expressing the wisdom gained by her long experience of dealing with men. For her part Julia Varady in the latter role brings a special freshness to her music, not least in her splendid Act III aria, by which time the character�s own confidence has grown. With Dietrich Fischer-Dieskau among the cast, there is the chance to enjoy one of the great opera singers in action. He is as alert as ever to the demands of teamwork, but it is still true that his Act I solo �Udite, tutti udite� is the highlight among several highlights, delightfully conveying his character�s personality in one of the most appealing numbers in the whole opera buffa tradition.